I’m up at 6AM making pancakes and I feel slightly Julia Child-like standing over the stove, wearing my fake pearl necklace I posted yesterday on trend & chic, my fashion (among other interests) blog. These pancakes are hearty, fluffy pancakes that are the epitome of classic pancakes. These are the pancakes you think of when you think of your basic breakfast pancakes. They have a slightly nutty flavour as well from the quinoa (we use quinoa flour and cooked quinoa in the batter), which compliments itself well to being generously spread with butter and drizzled with honey or maple syrup. Thanks to quinoa being nutrient-dense (protein and fibre, among other nutrients), these pancakes also fit the bill for this month’s theme of Go Ahead Honey, It’s Gluten-Free! hosted by Maggie of She Let Them Eat Cake. Standard blogging etiquette dictates that a recipe has to be made multiple times (anywhere from three to five to seven times, or more) before it gets posted, to ensure that it’ll consistently work and especially if you create your own recipes rather than adapt them from other sources. The thing is, I’ve only made this recipe once – this morning! – and I’ve decided not to wait. Technically I have made them only once, but I’ve been playing with the idea in my head for months and by that time, when I’ve been playing with ideas that long, they generally work out the first time. I’m crazy that way sometimes. (Or I could’ve just used the Mighty Decider: no need to make decisions even if it could slow down improvisation.) I know that they’ll be made again. As of yesterday, I’ve started restricting my blogging and Twitter time to the evenings so that I have more time to focus on my schoolwork and studying. So from this moment forward, until further notice, you’ll be seeing new posts in the evening – or depending on where you are in the world, in the morning. If that’s the case, what a great and lovely start to your day! I imagine this arrangement will just be till I’m done school, but we’ll see. The only exception during this juncture will be if I’m participating in a blogging event or guest posting in which my post has to be up by a specific time in the morning. 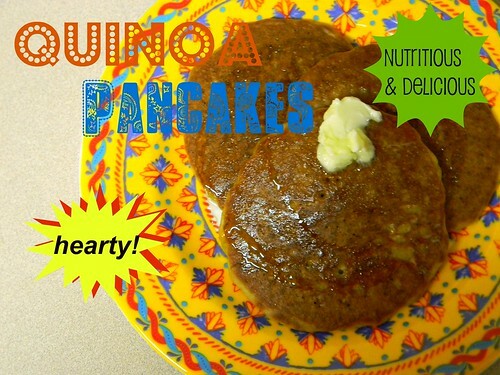 This quinoa pancake recipe is adapted from two different recipes, one from The New York Times and the other from Quinoa 365, from which I have previously shared a recipe for quinoa chocolate crepes. As previously mentioned above, these are hearty, fluffy pancakes. This is the closest I’ve got to recreating pancakes like this since my coconut macaroon pancakes, which I should make again soon now I’ve thought of them. Sift the quinoa flour, tapioca starch, brown rice flour, millet flour, sugar, baking soda, baking powder, and salt together in a medium bowl. Crack the eggs into a large bowl or similar vessel and mix with the olive oil, coconut milk, and vanilla extract. Gently whisk in the dry ingredients until you’ve made a thick batter, making sure there aren’t any lumps. Fold in the cooked quinoa. Heat a fry pan over medium heat with a little butter or oil. 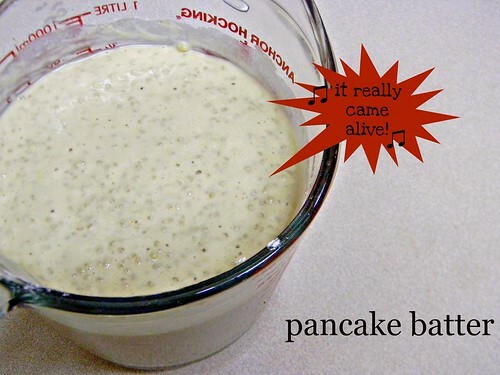 Once the butter has melted and starts to sizzle, pour in 1/4 cup of batter per pancake. Depending on the size of your pan, you may get to do two to three or four pancakes at a time. The pancakes will spread a little. 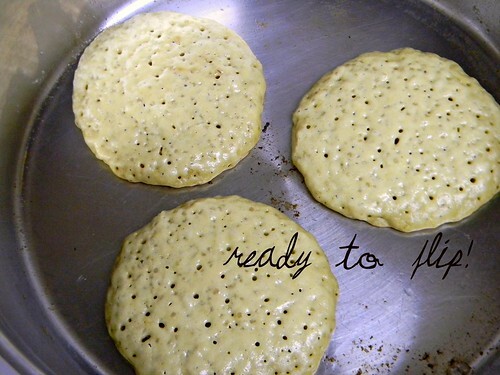 Fry the pancakes until bubbles appear all over the surface and the surface is no longer shiny and the bottom is an even golden brown. Flip and cook until the other side is browned. Transfer to a plate and repeat until all the batter has been used. Serve pancakes with butter and honey or maple syrup, or condiments of your choice. Enjoy! *Cooking quinoa: bring 1/2 cup quinoa with 1 cup water to a boil. Lower the heat and simmer for 15 minutes, covered. Remove from heat and cool for 5 minutes before fluffing quinoa with a fork. You’ll have a little leftover quinoa as it makes a little over a cup. Haha, what can I say? I like to be stylish in the kitchen. 😉 Thanks, Shirley! Once you’ve watched the video you’ll get why it’s even funnier about watching food come alive. It’s part of the song! That’s weird how you can’t tag me on FB, I wonder why? Maybe something I have to look into or just FB being wonky. We really should sometime, Maggie, whenever you’re next in Vancouver – or I’m in your area of the hood! That would be fun. I’ve never been to Ontario. Let me know and we can do something!